Mr. Hix entered our community following a hospitalization for generalized weakness and lower back pain. Along with severe arthritis, he had been dealing with a bulging disc in his back and was recovering from chemotherapy treatment for tumors on his spine. 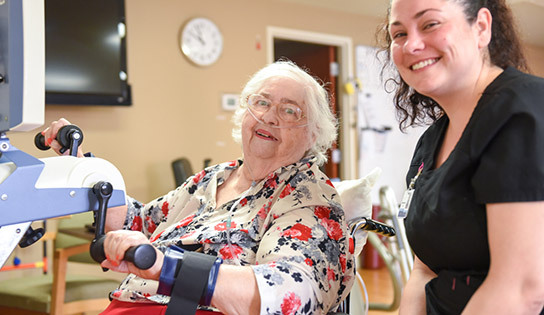 When arriving at Gallatin Center for Rehabilitation and Healing, Mr. Hix was greeted by his nurse, Kris, nurses’ assistant, Santos, and the community concierge, Billie. Mr. Hix met with the dietary and activities departments to discuss menu options and daily activities. He was also evaluated by the physical, occupational, and speech therapy teams, and has been receiving therapy six days a week ever since! Mr. Hix started off requiring assist for all functional tasks including walking, transferring, bathing, toileting, and lower body dressing. He displayed reduced cognition and safety and needed speech therapy to work on his memory and safety. With lots of hard work, Mr. Hix has progressed exceptionally. He no longer requires physical assistance with any functional tasks. He is able to walk 200 feet, can negotiate steps, and is continuing to build his strength and endurance every day. Mr. Hix favorite part of being at Gallatin Center is the staff. He appreciates how well they treated him, his guests, and family members when they came to visit him. He thinks the world of the therapy department and said they were very professional. Mr. Hix will soon be discharging from therapy when he reaches his maximum potential. We are so proud of him and the hard work he has done and will miss him when he is gone!